As a somewhat new member of the Government Relations and Advocacy team at IJM, I am still enchanted by the fact that I get to help fight for freedom on behalf of thousands every day. Social justice has always been a cause to which I have gravitated, and as someone who has been given a voice, I would like to use it in defending others. As a person of faith, a millennial and college student who studied politics and policy, I would say that I was bound to end up fighting for human rights at some time or another. As a young person (or a human being, in general! ), it can be easy to get involved in a cause and then become disenchanted or disinterested after things don’t progress as we would like them to, but human rights and human freedom cannot be won and maintained with that mindset. 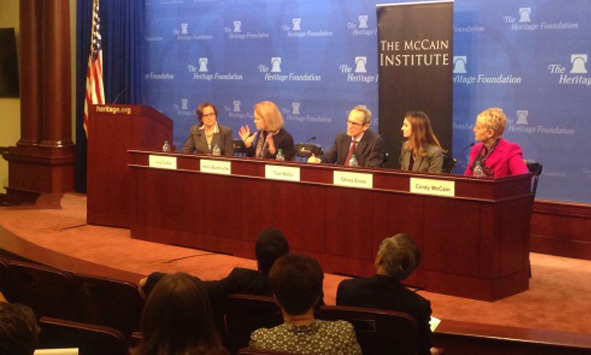 Last week, I attended a panel co-sponsored by The Heritage Foundation and The McCain Institute that addressed the topic of combatting human trafficking and the roles governments, NGOs and individuals can play. Five guests talked about their work fighting against human trafficking, and Holly Burkhalter, the VP of Government Relations and one of my bosses at IJM, was one of the featured speakers. Other panelists included Cindy McCain of the McCain Institute, Tom Kelly of Millennium Challenge Corporation, Olivia Enos of the Asian Studies Center at the Heritage Foundation, and The Honorable Chris Smith (R-NJ). One of the main ideas raised at this panel was that “stopping violence cannot be freelanced.” While there are numerous initiatives started by governments, NGOs, and bold individuals to end human trafficking, effectively combatting slavery, requires intense collaboration. While there has been an increased awareness drawn to the problem of human trafficking, more tactical solutions need to be implemented to end this problem. In the human rights battle, sustainability must become one of the key goals. Too often, societies take a “divide and conquer” approach when trying to fight social injustices, when unification on multiple fronts would make the fight more encompassing and enduring. With increased attention put on the issue of human trafficking and more work being done to stop it, the future is bright when it comes to creating a multi-faceted, united approach to combating human trafficking. From this event, one can see that as the fight against human trafficking grows older, more mature tactics are being developed to better address new issues as well as sustain the gains already won. We want programs and people that are both passionate about and thorough in bringing an end to trafficking. We don’t want a movement that slows down or impedes human slavery, but a movement that ends it.